On Sunday, May 26, the Community Center for the Performing Arts proudly welcomes Poor Man’s Whiskey back to the WOW Hall along with Eugene’s own Moonlight Jubilee. 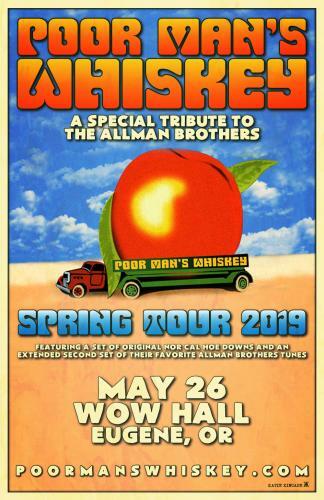 PMW will perform two sets – a set of original Nor Cal hoedowns and an extended second set of their favorite Allman Brothers Tunes. Poor Man's Whiskey is an American band originating in the San Francisco Bay Area rooted around the songwriting talents of Josh Brough and Jason Beard (whom met in 1993 at the University of California, Santa Barbara). PMW's live show and sound is blend of high-octane old time/bluegrass music (often done on traditional acoustic instruments of banjo, guitar and mandolin) and a more psychedelic blues/jam rock style that calls upon their earlier influences such as Pink Floyd, The Allman Brothers Band and the Grateful Dead. Poor Man's Whiskey seamlessly transitions between acoustic and electric styles with a carefully crafted commitment that revolves around well-written songs and stories... while maintaining an exciting element of improvisation and the openness to let a song expand. Besides their seven original albums and high energy shows, Poor Man's Whiskey is also known for their special "interpretation sets". They gained international attention by their bluegrass rendition of Dark Side of the Moonshine (a bluegrass take on the classic Pink Floyd album), as well as successful interpretive sets of Paul Simon's Graceland, The Allman Brothers Band, The Eagles, Old and In the Way, and Kate Wolf. These sets are played in conjunction with an original set or a special festival late night party. Jason Beard - Guitar, Mandolin; Josh Brough - Vocals, Banjo, Keyboards; Jeff Coleman – Keyboards; Mark Murphy – Bass; David Noble - Guitar, Vocals; George Smeltz - Drums, Vocals. Band Discography: Rock Star On The Weekend (live)-2016, Whiskey Under the Bridge-2015, Barrel Aged Whiskey (compilation)-2014, Like a River-2012, Goodbye California-2011, Dark Side of the Moonshine-2009, Roadside Attraction-2005, Train To California-2003. Career Highlights: Hardly Strictly Bluegrass, Kate Wolf Festival, Byran Bay Blues Festival (Australia), Wakarusa Music Festival, 4 Peaks Music Festival, Northwest String Summit, Summer Meltdown, Joshua Tree Music Festival, SCI's Horning's Hideout, Phases of the Moon, High Sierra Music Festival, Dead on the Creek, Evolve Music Festival (Canada), Hillside Music Festival (Canada), Strawberry Music Festival, Telluride Bluegrass Festival (band competition finalists), Jibberjazz Music Festival, Road To Rich's, Earl Fest, Salmonstock (Alaska), Petaluma Music Festival, Hangtown Halloween, Las Tortugas, Lohi Music Festival, Multiple Sold out show's at the Fillmore, San Francisco, and many many more! If you leave Appalachia somewhere between Saturday night and Sunday morning, take the turn off for Muscle Shoals, slight right at New Orleans and keep heading west then you’ll arrive at Moonlight Jubilee. With their high energy stew of bluegrass, old-time, Irish, soul, swing, folk and blues music, Moonlight Jubilee has been spreading their good time music all over the Willamette Valley since 2017. Moonlight Jubilee is Jessilyn Brinkerhoff (fiddle and vocals) , Eric Estling (guitar and vocals), Steve Korin (stand-up bass) and Austen Sloan (mandolin and vocals) and for this show featuring special guest Jack Wheeler (dobro and vocals). Tickets are $18 in advance, $20 day of show. Doors open at 8:00 pm and showtime is 8:30.